No one wants to use a CPAP machine. But millions of people have no choice in order to deal with obstructive sleep apnea, a serious condition that causes sufferers to stop breathing while they sleep. Sleep apnea is associated with heart disease, high blood pressure, type 2 diabetes and other conditions. CPAP stands for Continuous Positive Airway Pressure. The reason no one wants to use the machine is that it consists of wearing a face mask to increase the air pressure in your throat so your airway doesn’t collapse when you breathe in while sleeping. There are more than 8 million CPAP users in the United States, according to SoClean CEO Bob Wilkins, and their numbers are increasing by 8 to 9 percent yearly. Wilkins said most sleep apnea sufferers in the United States remain undiagnosed. He estimates there are another 20 to 30 million potential CPAP users in the country, making the market for SoClean gigantic. SoClean is the world’s first automated CPAP cleaner and sanitizer, Wilkins says, utilizing an activated oxygen sanitation process. 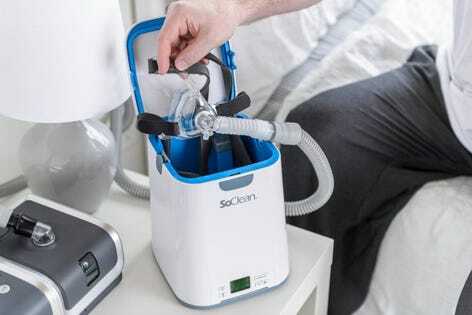 With a patented design and ozone technology that doesn’t use any water or chemicals, SoClean claims to kill 99.9 percent of CPAP germs and bacteria, sanitizing the entire system without disassembling the machine. You can imagine why it’s important to keep something you’re breathing into every night clean and sanitary. The SoClean machine retails for $319. Wilkins declined to discuss annual revenue for the privately held company, founded in 2011 in Uxbridge, Massachusetts, but he says SoClean has penetrated more than 10 percent of the market in the United States, which would work out to close to a million units sold. In late 2017, SoClean was purchased by DWHP, the Toronto-based healthcare private equity firm founded in 2002. DWHP noted in a recent press release that SoClean, now headquartered in Peterborough, New Hampshire, was named the 54thfastest growing techology company in America on DeLoitte’s Technology Fast 500, having grown revenue by 2,805 percent since its founding in 2011. “We grew very rapidly over the last four years,” Wilkins acknowledged. The company is also looking to expand internationally. People in every nation suffer from sleep apnea. Wilkins says SoClean launched in the United Kingdom a couple of weeks ago on Amazon.com, and will launch in Germany and France some time next year. SoClean was born out of another company called VenMill Industries, which makes machines to take scratches out of CDs and DVDs, and was selling at the time to clients like Blockbuster. Wilkins, a serial entrepreneur, was serving on the VenMill board of directors. “We went to every employee and asked them to come up with another idea for a business,” Wilkins said. “I said, ‘What’s a CPAP machine?’” Wilkins remembered, laughing.